Posted on April 10, 2017 May 10, 2017 by STACi P.
Hey Friends! If you’re following me already on Instagram, you may be familiar with my not so recent change to a Pescatarian diet. If you’re not, it’s all good — I wrote a full post on my food journey. You can read it here. Now that I am fully indulged in this Pescatarian lifestyle and #TransitioningToVegan, I am much more conscious about foods I’m putting inside of my body, including snacks. I find myself picking up more fruits and berries than cookies and cake. Actually, even when I was eating meat, I enjoyed a few handfuls of trail mix filled with raisins, chocolates, peanuts, almonds and cashews! Just so happens that one day, I caught myself eating everything except the chocolate. That’s when I knew my taste buds had shifted again and it was time to look more into the world of nuts! Most people think peanuts are nuts, solely based on the name. Heck, I did! However, peanuts are technically a part of the legume family; more like beans, lentils and soy. Who knew?! Unsalted peanuts are good sources of protein. Ideally, about “39 peanuts” (haha, I know! Who is counting 39 peanuts?!?) or a handful = 1 serving. At a baseball game or in your granola bar, there are plenty of ways to enjoy these gems! These funny looking green things had me very skeptical at first. I didn’t know what they were! When I looked on the back on the container to see pepitas are just a fancy word for pumpkin seeds! I like pepitas better 🙂 Come to find out, they’re a really good source of omega-3s, vitamin K, iron and copper. Pepitas also provide 10 grams of protein in one 1 oz serving. There are all kinds of ways to eat them, too! Like most nuts and seeds, you can add in your salads, mix in your baked goods, or eat them straight up raw and unsalted! For me, sunflower seeds are the originators of this list! Do you remember ripping open that red and white David bag, sucking off the salt, cracking and spitting the shells and eating those tiny little seeds as kids? Never did I know the raw and unsalted version were so healthy and beneficial to our diets! Sunflower seeds are one of those “good fats.” One ounce of sunflower seeds can provide 12% of your daily protein intake. That’s what I’m talking about! They say big things come in small packages. Almonds are the seeds of almond trees! Obviously, Staci. Almonds contain vitamin E, vitamin B2, iron and other important nutrients. They’re known to promote weight loss, more specifically help reduce any extra pudge in our stomachs. Almonds are relatively high in protein, with 6 grams of protein per ounce but like most nuts, they aren’t a complete protein source. However, when pairing with the others listed, you’ll get more punch in one handful. How do you eat your almonds? Baked? Raw? Last but not least, walnuts! I feel like every Black family in the 90s had a glass candy dish full of pecans and walnuts with the nutcracker hanging off the bowl. Nevertheless, they were on to something. Walnuts are a tree nut, making them rich in omega-3 fats and contain higher amounts of antioxidants handouts other foods. Walnuts can also add protein to the vegan diets or those transitioning like me! 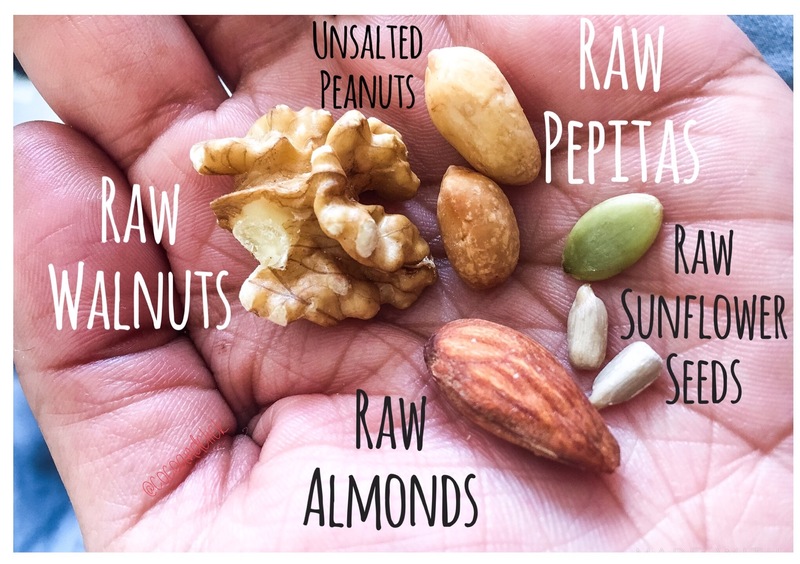 Typing all of this up has gotten me hungry for a snack and now you know my first choice is to grab a handful of nuts, or seeds, or legumes … whatever you want to call them! They’re tasty and provide a source of protein, just as I desired! If you’re not allergic, which nuts do you eat? Do you have a favorite way of including them in your diet? Any recipes? Please share and continue to follow me on my journey to #TransitioningToVegan!